The report also contains the table of key performance indicators for co-operative banks in 2017 that illustrates the strength of the sector. Co-operative banks serve 209 million customers and 81 million members, they manage more than 7,2 trillions Euro in banking assets and safeguard 4 trillion Euros in deposits. They extend loans for more than 4 trillions Euros. 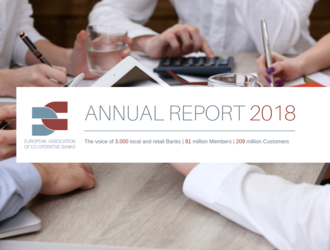 Gerhard Hofmann, EACB President, stated: "The year 2018 was once again reassuring for co-operative banks, which continued to excel in client-related activities and steadily increased their capital levels and thus their robustness. The overall performance of co-operative banks compares quite favourably in European banking markets. Several trends have had an impact on EACB’s activities in 2018, among them sustainable finance; the impact of Brexit; the subject of customer data; on the prudential side, the ‘Banking Package’; but also the International Accounting Standards Board’s (IASB’s) Discussion Document on Equity/Liability distinction. Looking forward to 2019, the EACB is up to new challenges, as it was up to the challenges that 2018 brought. Finally, we expect Europe to protect and defend the European model of banking intermediation, which means that many enterprises, especially the smaller ones, are supported and accompanied with their local or regional banks. Market-based financing of the economy is complementary to bank financing but not an alternative or substitute. I hope that reading this annual activity report will raise your awareness about the EACB and more generally about co-operative banks." We wish you a pleasant reading of the EACB Annual Report 2018!